Our winter guests know and love Snowmass's family-friendly appeal, but now our summer guests will also flock to the top of the Elk Camp Gondola to experience the new Lost Forest. 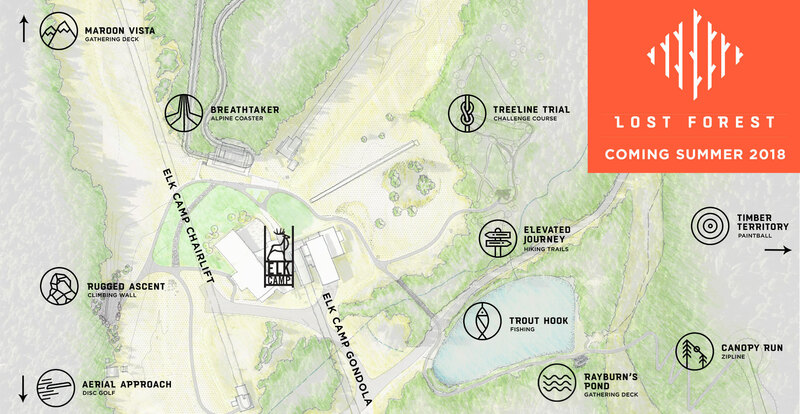 The Lost Forest opened in summer 2018 and was an instant success, inviting adventure-seekers to lose themselves amid a secret world of zip lines, biking trails, climbing walls, disc golf courses, rope challenges, and a thrilling alpine coaster. All these man-made adventures are tucked into the picturesque forests and rocks surrounding Elk Camp atop Snowmass. There is also plenty of fishing, hiking and beautiful scenery to take in. For Lost Forest passes, contact the Frias Properties concierge or purchase them online here. Aerial Approach Disc Golf - Play a round at one of the highest-elevation disc golf courses in the country. There are two 18-hole courses available to test your mettle. Breathtaker Alpine Coaster - Drop more than 400 vertical feet and reach speeds of up to 28 miles per hour on the new Breathtaker Alpine Coaster. Whisk through the wilderness on an elevated track. Open every day from late-November through late April, in conjunction with gondola and list operations at Elk Camp. The coaster will also be open at night during Ullr Nights festivities next winter. Elevated Journey Hiking Trail - Take in all the beauty of the Rocky Mountains on this series of fun and motivating hiking trails. Maroon Vista - A beautiful gathering deck at the top of Elk Camp Chairlift that's great for photos or meeting up to relax following a full day of activities. Rugged Ascent Climbing Wall - Test your mettle on this challenging custom climbing wall that's perfect for beginners or experts. Treeline Trail Challenge Course -High-ropes course with plenty of obstacles along the way. Includes five different paths at five different skill levels. Timber Territory Paintball - Competitive outdoor paintball with natural and man-made features. Equipment, transportation and paintballs provided. There's plenty to see and do while you're at the Lost Forest. The map below is a great reference for navigating all of the fun!